How can something that looks so delicate be so sturdy? I’ve had this beautiful blouse since I was a child. It was given to my aunt, along with several other wonderful garments, by her weatlthy employer who no longer wore them but thought I might like them for playing “dress up.” My little friends and I enjoyed them for years, not realizing what we had. Unfortunately, not many pieces survived our play, but I know they inspired me and helped to instill my love of beautifully made clothes. The blouse has a self belt on the inside that closes with a hook and eye. Ties at the sides also bring it in at the waist, while maintaining a loose look. 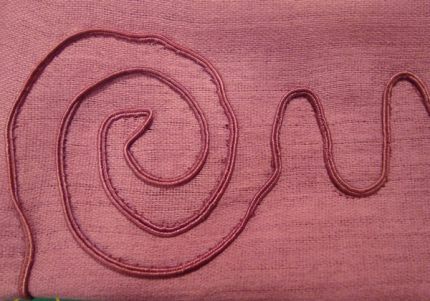 The soutache is applied to the silk with stitches along one edge, so the braid stands on end. 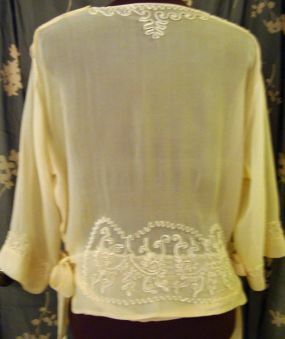 This silk blouse looks very delicate, but it is amazingly sturdy. 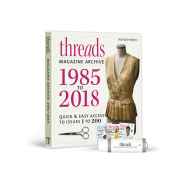 For all it has been through – including a several day long soak in Oxiclean to remove all the brown stains – there are no broken stitches on it, no ripped seams, no holes in the silk fabric, and all of the braid remains completely intact. I’m guessing it was made in the 20’s. 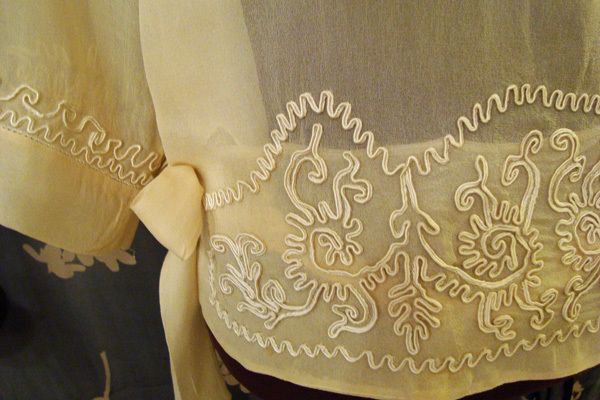 In fact, in a recent episode of Downton Abbey, Lady Mary was wearing a blouse with similar soutache embellishment. 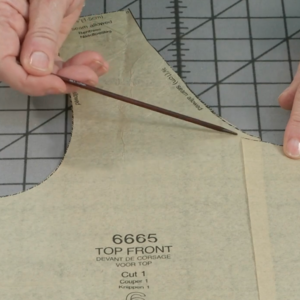 A deep hem adds a little weight. Hemstitched tucks add detail at the shoulder. The seams and hems are all sewn by machine, but the soutache application has been a mystery to me. The stitches that attach it to the blouse are so perfect they look machine done, too, but I can’t figure out how that’s possible. 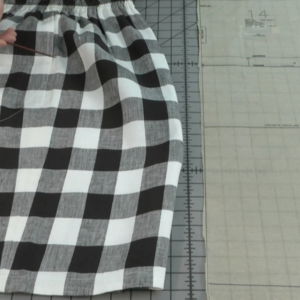 The seams and hems are sewn by machine. 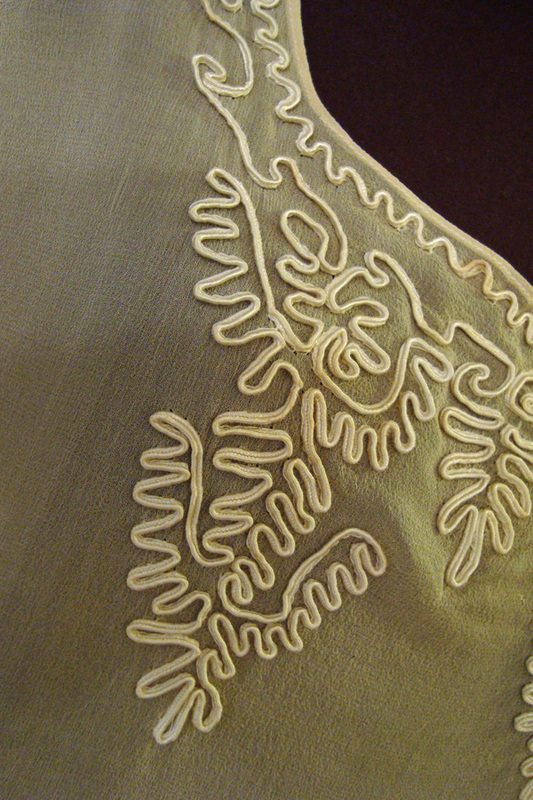 The stitches attaching the soutache are so even, they look machine done, too. So I recently thought I would experiment to see how I might do this technique and I thought I’d share it with you. I started by drawing a simple design and transferred it to a swatch of cotton gauze. I pinned the braid over the design and steamed it to hold in the shape. First I tried to apply it by machine. My instinct was to use a cording foot, but that wasn’t successful because it sewed the braid flatly down on the fabric. I switched to a clear appliqué foot and a blind hem stitch. This worked well – but it takes a lot of practice to maneuver around the curves. 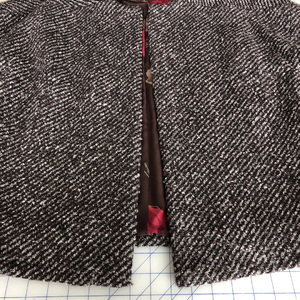 I switched to hand stitches, using a type of slipstitch and holding the braid to one side with my left hand so I could sew it in place along one edge with my right. I tried a sample on some cotton gauze. I drew a simple design and transferred it to the fabric. 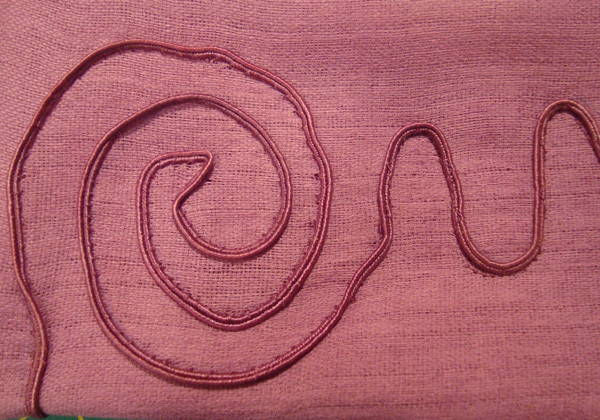 I shaped the soutache first by steaming in the shape. 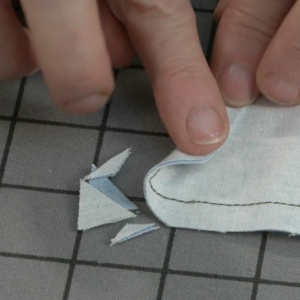 I sewed a section by machine using a clear appliqué foot and a blind hem stitch. 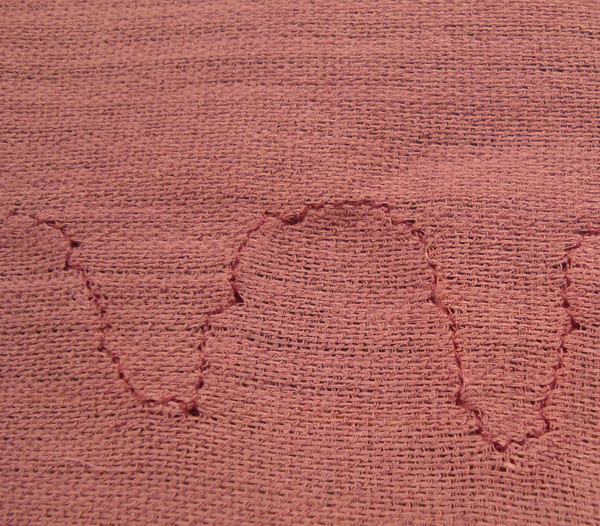 My machine stitch is not as beautiful as the original. 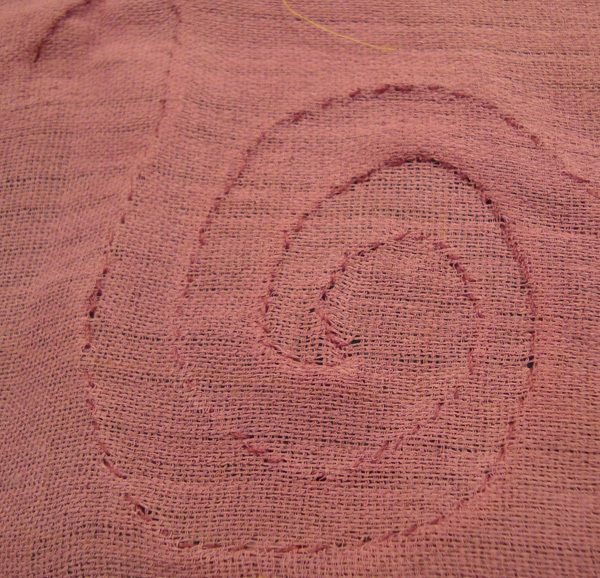 I used a slipstitch to sew the remaining section by hand. Looking at vintage garments is an inspiration and can be a great teaching tool. I certainly haven’t yet mastered this technique, but trying my hand at it gave me a little more insight into how this garment was made. And now I appreciate its loveliness even more. 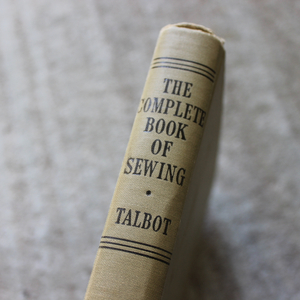 Do you own any vintage garments that have influenced your sewing? 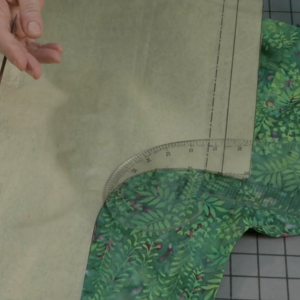 Have you ever tried to re-create details from vintage blouses, dresses, or pants? If so, tell us about it! Project Runway Season 11: Episode 4, "The Ultimate Hard and Soft"
What a beautiful blouse, and that soutache ornamentation...! I wonder if they might have used a hoop and some kind of special attachment or template, considering how popular this type of work was back then. Or did they perhaps commission it in India or China, where handwork on an industrial scale was also common? I just love this blouse and would wear it. I not only love the soutache ornamentation but I love the inside belt. I don't think I've ever seen that and I might try it. No vintage items in my home. Years ago we played with grandma's old clothes, which were probably lovely. This was a nice sharing memory, too. I would like to ask Mary Ray where she got the pink/rose soutache braid. Is this something widely available today, or was vintage braid what you used in your gauze fabric test? This is what people did before TV (and computers and iPads). My guess is that it was hand done perhaps even here in the good ol USA. My mother worked in a garment factory prior to WWII. 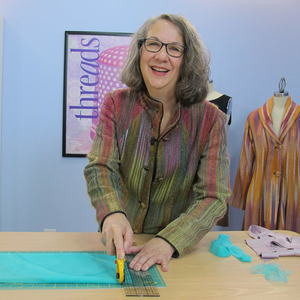 I learned to sew by watching her as she made the family's clothing at home. I seem to remember that many instructions in the pattern pieces called for handwork. 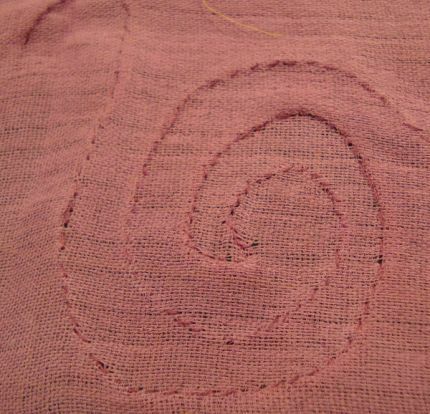 If you set your cloth correctly on your lap with a hoop or on a table without one, you could get quite fast, regular and rhythmic which was a very soothing thing to do. My husband once had a girlfriend in Japan who hand sewed him a Kimono. Every stitch perfect. 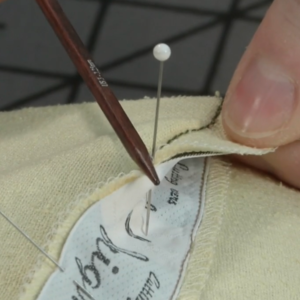 I think we've lost something when we don't include a needle and thread as a first tool. And don't forget most women in America before WWII sewed for themselves and hand embroidery work was everywhere and very elegant and intricate. I hope you post more experiments in elegant clothing construction. Maybe you could figure out how that belt was put together. 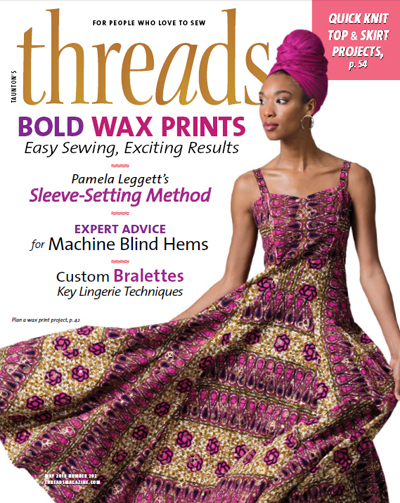 I wouldn't swear to it but in my MANY years of sewing, I think I might remember that there was a special machine used in the industry which sewed the braid on? 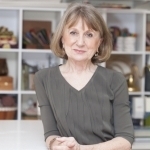 I love the look of soutache and I've had some success applying soutache with a machine. 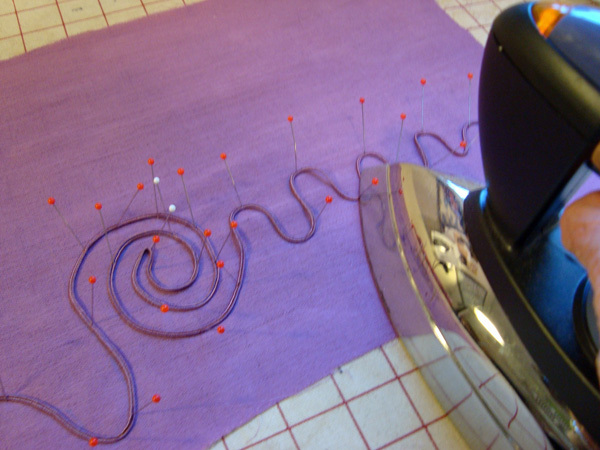 I use fine, clear thread and zig-zag it in place. I hold the braid flat against the bar of my blind-hem foot and stitch over it, not through it. Thanks for sharing your beautiful blouse. I love the hand and the machine work. I'm a Baby Boomer, so I remember some of my Mother's as well as both of my Grandmother's garments with lovely embroidery and trims. 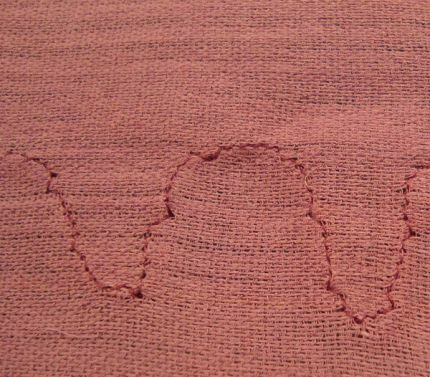 there is an Omni Stitch machine that does this! 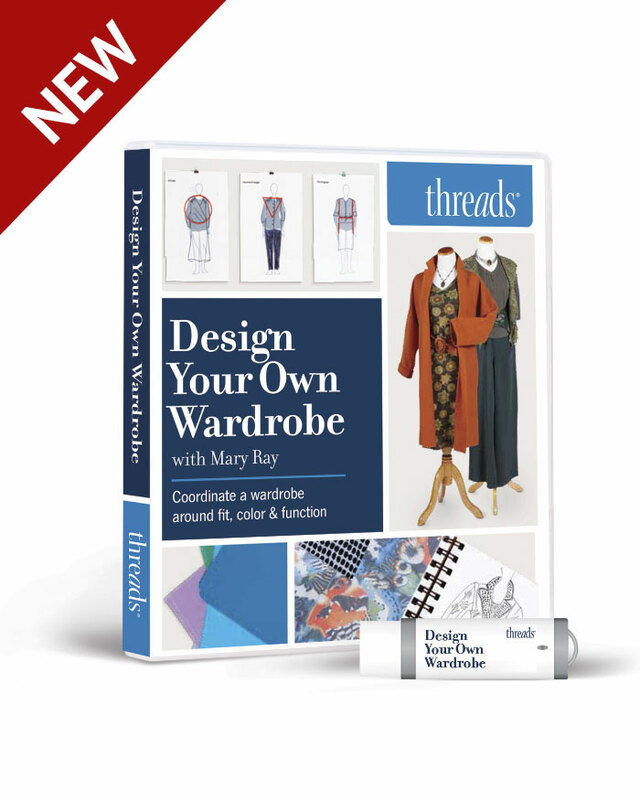 I found one on Ebay but sold it a few years ago as I'm an obsessive felter now -- it has a guide for the braid/ribbon to thread through and there were a few models so if you are interested do some research to find the one that works for your application. Thank you all so much for your comments and your insights. I was thinking that it could be a special machine that did this stitch, but it's also very possible it was finished by hand. I wish I knew more about the history, but I'm happy to have the piece in tact. There were many other garments that my aunt sent to use for dress up and they didn't survive. There were beaded blouses and a wonderful wool coat with a silk lining that was very Japanesque as I remember. I would love to have them back, but I'm also happy that I had the opportunity to play with them as a child -- they were definitely better than the Barbie I never had! The pink soutache -- I can't remember where I purchased that. I have a small plastic container filled with odds and ends of trim and found it there to make this sample. Just another reason to have a "stash!" Several years ago I developed a method to stitch the intricate soutache braid. As you did, first draw and mark the design lines; make it a continuous line. Next pin and "glue" it in place. (we had a product in a tipped bottle called Liquid Pins.It dried clear and brittle, not sticky.) 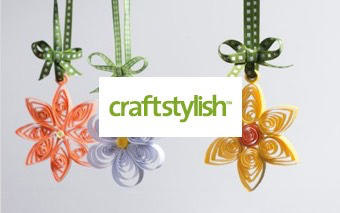 Use free-form stitching to stitch straight stitches in the center groove of the soutache, using color-matched thread. It's much like free-form quilting...must be very precise. Using feed dogs with any foot doesn't allow for the tight turns of the braid.Some "yarn-feed" feet have been developed in recent years, but none that I've tried would handle the stiffness of soutache. I'll find the great obi-type belt I did and send you a photo. To my eye the stitches look machined, not hand done. Two possible ways to do this by machine. 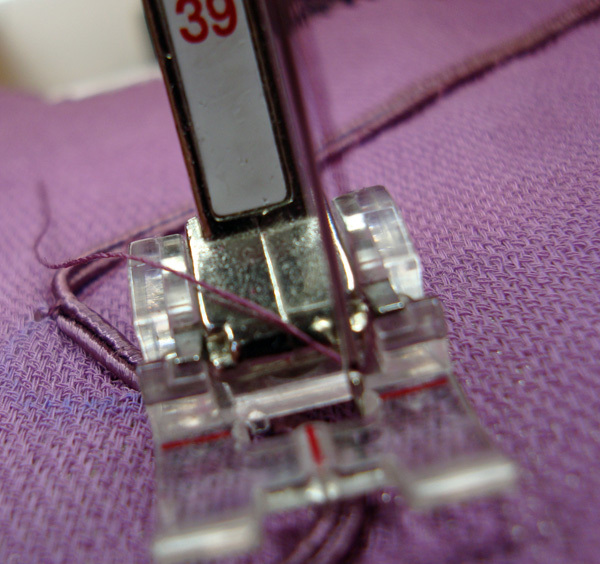 2- sewn on top with a blind stitch braider foot, which feeds the trim from behind the needle so the needle would just catch the bottom of the trim to the top of the fabric and then the trim goes under the foot as the machine sews the next stitch. Either method should leave nice even stitches such as those on the vintage blouse. Most likely this was done by an specialized industrial machine and/or special attachments--because the soutache is raised--but domestics, such as this Singer had similar attachments. The only way I could see this done by hand is from the wrong side with the blouse fabric stretched on a tambour frame, sewn with a hook. 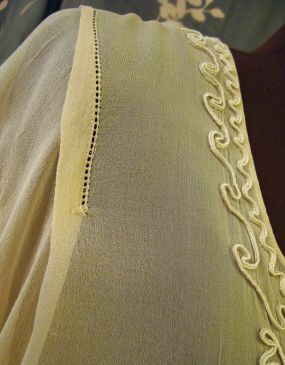 But tambour stitches are like crochet stitches--a chain stitch--and the stitches on the blouse look like lock stitches. A lovely blouse in any case. Hi. Not sure if this is relevant but I trained in a couture house and, as a trainee, could not believe the rows and rows of identical stitching that could be produced - it took time and practise! Eventually I could produce small, neat matching stitches by the yard! As the blouse is silk, and from a period in time when soft, beautiful fabrics were the norm, I would expect it to have been done by hand. Will be trying this for myself soon. 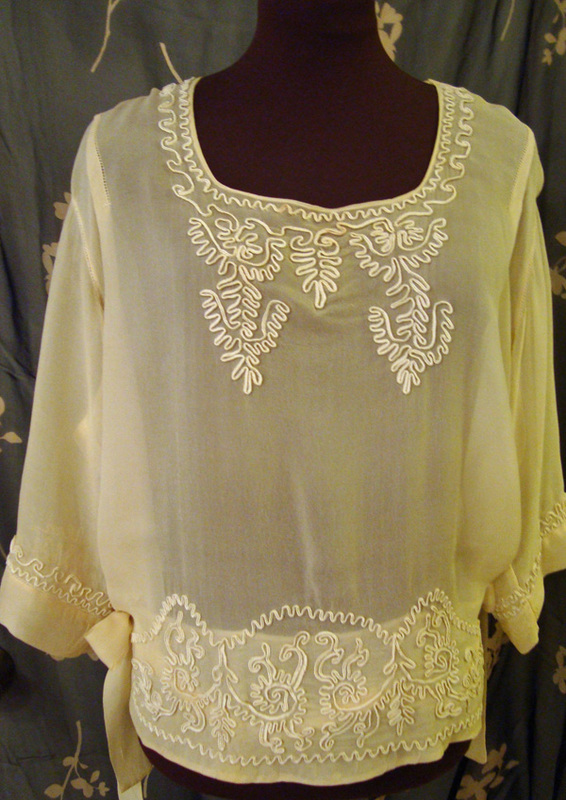 I agree that hand stitches can look as fine and even as those on this blouse. However those stitches look like machine stitches. The stitches show on the front--you can see them on the edge of the trim in the close-up--if you were sewing by hand you certainly would not let your stitches show on the face of the fabric, especially if you were using couture techniques. because of the tight corners and curves. I believe you could set the machine up for sewing on the edge of the trim. Even early sewing machines had attachments for specialized applications or the machines themselves were specialized. Cornelys have been around since the 1870s. I love vintage 40's, 50's and 60's. 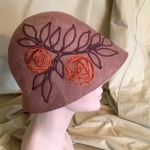 I have a few pieces with plans to create new things using vintage patterns. In the last few years, I've even started incorporating hand sewn embellishments (inspired by Natalie Chanin)to my clothes which allow me to use all those embroidery stitches I learned as a girl. Thanks for all the great info. I think I'll try this idea by hand. 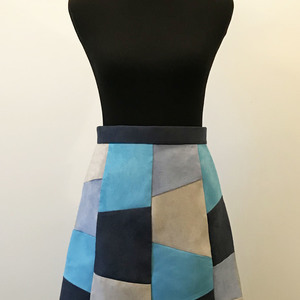 I am a novice here, but I appreciate the comments about hand sewing. 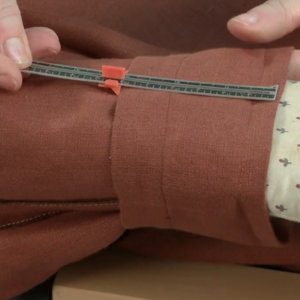 Yet, I appreciate that for the sake of a broad audience machine sewing makes projects easier; however, I wish to make historical clothing so I expect to hand sew at times. 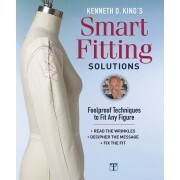 If I only knew where to find hand sewing tutorials, but that is another issue. There are people out there like me who would like to learn both machine and hand sewing for as in this lovely blouse, the details make the garment. Hi, My favorit designer was Erte'. I found a vintage organza dress and the sheer fabric at sleeve and bodice area was starting to come apart so i think i will use wonder under on the lining with new fabric to cover the bad areas and i have been enbroidering flowers using organza and matching lining and than attach the flowers to cover the reconstructed areas and down the full skirt. The dress is copper colored. Some of the flowers will have seed beads in the centers. I will make a matching clutch purse. 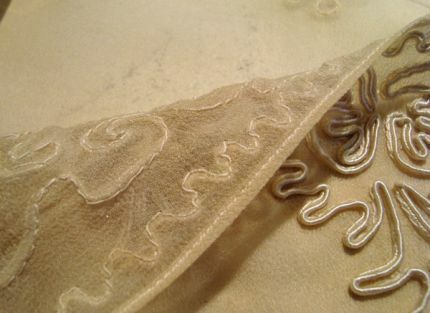 Attaching soutache in an intricate design by modern machine is time-consuming but possible. 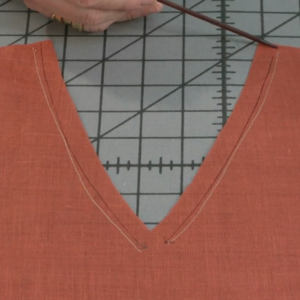 But, a design as involved as shown on the blouse, could be fairly quickly attached by hand after some practice. 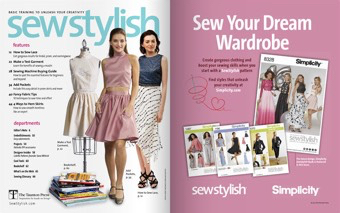 I had an article in Sew Beautiful, issue #139, "Harvey Glidden's Dress", that was a reproduction of a vintage garment in the DAR Museum Book. The original was a boy's dress in red wool with intricate black soutache applied. For my dress,I shaped and attached the soutache flat and used a 2-3 mm embellishment foot. This type braid can shift and bunch if the presser foot is directly on it. The design I used was not as intricate as the blouse shown or the original dress so using a conventional machine worked well enough. I can't speak to vintage application techniques with machines. 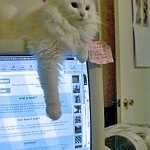 When doing research for the original article, it was difficult to find any application instructions. I learned more from the one Kenneth King article in a past Threads and close examination of several vintage and antique pieces in my personal collection. 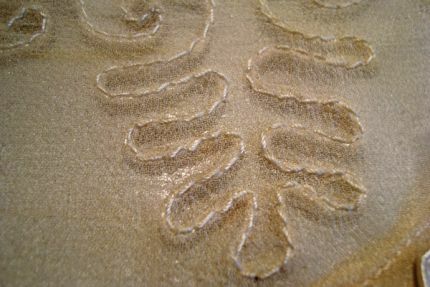 Using Roxanne's Glue-Baste-It, I have made several garments with intricately shaped soutache that I stitched on by hand. 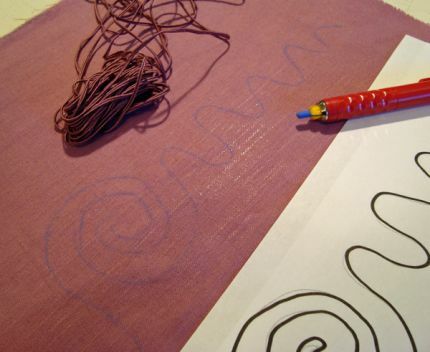 Using a matching thread with similar sheen (cotton soutache and more modern rayon soutache have different sheen), backstitching was easily worked in-hand, usually hanging out with my kids watching a movie or at a ball game. The soutache was definitely applied with a Cornely machine. This type of machine was very common from the 1890's through the 1960's and they are still used in many parts of the world, especially India and African nations. 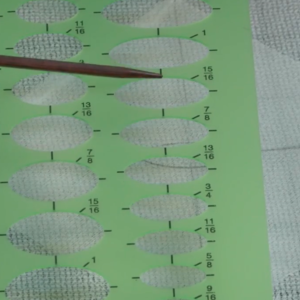 It would not have been cost effective for a manufacturer to pay people to do this type of work by hand. Cornely, a French embroidery machine company, developed dozens of specialized embellishing machines which ranged from basic chainstitch embroidery machines to fanciful machines which applied sequins and beads. Beginning in the early 1900's Singer manufactured a clone of the Cornely machine, the Singer 114w series. Thank you for this information. I had not heard of a Cornely machine. I did a little searching online and just found a great video on YouTube that shows a pair of extremely skillful hands using the machine. Hope you can all check it out. It's very cool. Do I need one of these??! Apparently there are some for sale on ebay. Help! MaryRay, I moderate a chainstitch embroidery machine resource group on Yahoo Groups. There is a ton of information on these wonderful machines including copies of instruction manuals and tips and techniques. If you're considering purchasing one consider that these are industrial machines so there is a space consideration. Also many of the available machines are antique or very vintage and repairmen who can service them are few and far between so be sure to find a machine that has been tested and is complete. Having said that, they are wonderful machines and will open up a new world of embellishing! I made the video you have commented on, the Cornely FD. After looking at your photos, I can see it is possible to use 3 different models for this work, 2 of which were avail during the 1920's. The Cornely FB and Cornely FD. A little later Cornely issued the Cornely FBN, which would also do the same work. Follow this link, you will see the most amazing array of cornely machines that can be found on the net. and yes you will need one of these machines to do that work with ease. Let me know if your seriously looking into buying a machine, I can help you out there. New Orleans. We too played dress up with it as children. costums. Wish I still had it. left handed embroidery book on Amazon and have never looked back. Makes a world of difference. Interesting comments. I didn't know about the Comely machine either. I found the passementrie-trimmed belt I made with my modern sewing machine. But I can't see how to attach or insert photo. Can you help? I want you to see this. Does anyone know where I can get a book on vintage blouses? I have been using a Singer sewing machine from the 1930's with the underbraider attachment. It take a little getting used to, the designs have to been continuous with no overlaps. 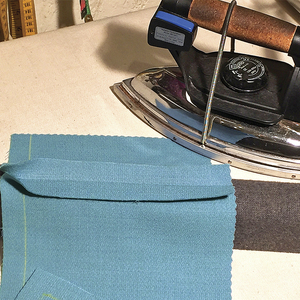 To do light weight fabrics, you probably would have to use a tear away stabilizer. 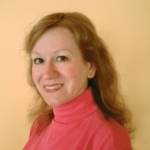 I'm not sure if there is a way to post pix on this comment page but my profile image is one of my hats. What a great look for a modern nod back to a vintage look. I think your running stitches look like the easiest. Good idea to steam in the curves ahead of time. Any thoughts on how to figure out how much you might need? The site I used to see about ordering soutache sells it by the yard or in a 288-yard spool.